Greenleaf is an American 60 minute scripted drama television series, which kicked off on June 21, 2016, on Oprah Winfrey Network and is broadcast every Wednesday at 22:00. The show is currently in its 3th season. Oprah Winfrey Network has officially confirmed the renewal of Greenleaf for Season 4. The exact release date is yet to be announced so far. Sign up to track it down. 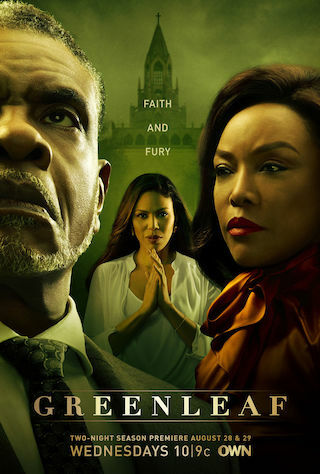 The drama series Greenleaf takes viewers into the unscrupulous world of the Greenleaf family and their sprawling Memphis megachurch, where scandalous secrets and lies are as numerous as the faithful. Born of the church, the Greenleaf family love and care for each other, but beneath the surface lies a den of iniquity - greed, adultery, sibling rivalry and conflicting values - that threatens to tear apart the very core of their faith that holds them together. Oprah Winfrey Network announced today it has renewed for a fourth season its hit megachurch drama series "Greenleaf." The show will be back in 2019.